This Custom Desk Calendar is a classic yet very successful item for marketing campaigns, as it has many ways of being customized. Plastic is very versatile and durable and you can even match your corporate pantone colours to the product. Calendars are a must-have for every office, so why not try this unique Plastic Custom Desk Calendar? This Custom Desk Calendar has hinges on the bottom so that it can be positioned to fit your desk perfectly. Then, the calendar has a seperate plastic part that can be moved across the days of the month. Not every month is the same, so this is a nice little extra function for this Custom Desk Calendar. Why do we like this Custom Desk Calendar? 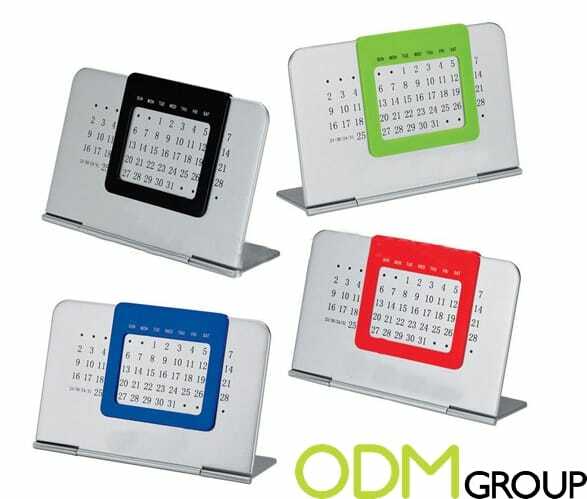 Great branding surface: The calendar has a great branding surface area where you may brand your theme, signature colours and logo on it. The options for customisation are endless! Design appeal: The unique design of this Custom Calendar makes this promo item a great eye catcher for your desk. This will increase brand awareness and attract new customers when they walk past your desk. Increased Brand Awareness: The logo on the Custom Desk Calendar may also boost brand recall and create reminder advertising to existing customers. This will enforce brand loyalty and encourage the customers to make repeat purchases.